When I started crocheting, blocking was a mystery to me! Today, I want to share with you what I have learned. Blocking is a technique used to “polish” a completed piece. By polish, I mean to make the piece lay flat and take the desired shape. The technique is great tool to have in your crochet medicine bag, so to speak. Blocking requires that your project be completed. When you have finished a doily, it is the perfect time to block. 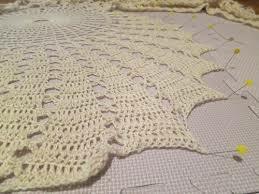 After blocking a doily, you will be able to see the beautiful lace pattern. Blocking sets the stitches in the doily to hold that beautiful design. Some hooksters block each granny square before sewing together. This allows the blanket to be uniform and have completed look once joined. Most clothing patterns require specific measurements for sections or panels. If crocheted slightly smaller than the desired measurements, blocking can allow you to stretch and set the section to the correct measurement. The most important instruction is to read the yarn label for any special care instructions. Many fibers can benefit from steam blocking, BUT some specify NOT to block at all! So make sure that you are reading the care instructions before proceeding. Cold blocking is best for the fragile yarns. You pin the edges of the piece into the desired size and shape. Cover the piece with a damp towel. When the towel is dry, the piece has been blocked. Wet blocking is best for thread projects like doilies. If the yarn label states that it is hand washable, use a mild detergent and rinse the piece. Do not wring or twist the piece. To draw out the excess moisture, lay the piece out flat and pat dry with a towel. Pin the piece in the desired size and shape. When the piece is dry, it has been blocked. Steam blocking is the most popular method. It is a great technique, used for most projects. Make sure not to steam items that can be damaged by heat. Pin the piece into the desired size and shape. Hold your steaming iron or steamer slightly above the project. Steam the piece thoroughly, making sure NOT to touch the iron to the fabric. Touching the iron to the piece can scorch the yarn! Leave the item pinned until it is dry. Once it is completely dry, the piece is blocked. What other advice for this would you share with others? I am in my late 20's. I live in the hills of the Appalachian mountains in Tennessee. I love to crochet and invite you to join in on the fun! This entry was posted in Advice & Tips, The Tennessee Stitch: Daniele Dyer and tagged Advice, Crochet, Danielle Dyer, ideas, Make, steam blocking, The Crochet Crowd, The Tennessee Stitch: Daniele Dyer. Bookmark the permalink. Back in the 70’s I made a granny square afghan. It was beautiful,trimmed and sewn together with black yarn. I then blocked it. It turned out terrible! I ironed it and it smashed all my stitches. I ironed right on it instead of steaming it . I didn’t know any better. It turned out hard and ugly. Never again!! Next week I will be covering yarn labels……the symbols actually tell you whether you can or cant and what the best way to block is 🙂 I hope to see you then and that it will help as well. The steam blocking instructions paired with that photo could be confusing… the written instructions do not say to cover the fabric being blocked but in the photo there is a cloth over the piece… and it says to not touch the iron to the fabric yet the iron in the photo is clearly touching the fabric. @ Elizabeth Thompson…why can’t you use liquid fabric softener when washing your items?? I am assuming that it affects different projects differently and MAYBE wont allow it to dry as fast or makes it too soft?? Thanks for the kind words and the support. I learned some basics from my grandma ages ago, but only recently decided to go back to crocheting and it’s fascinating, i hope i can master it and start making proper beautiful things. When working with the yarns of today, that are machine wash and machine dry, do not use a liquid fabric softener. I have had good success with dryer sheets. I do not let the article dry completely, but get it out of the dryer whiles still slightly damp. For large items, I “block” on my bed by simply smoothing and shaping by hand. The heat from the dry and the sheets really soften the yarn. Easy to do and no risk if you use the correct settings on the machines. For the thread items I have always blocked them wet. A lot of them require heavy starching for correct shaping, especially the Christmas tree ornaments including an large angel for the top (I use a white school glue starch). This is all new to me because I am new to the more advance crocheting. The funniest part is I hate to iron, when I was growing up, I iron all the time and was so Happy when we got a dryer that could do most of the work for me. Now in my older years, i am still like that, I rarely ever use a iron but will keep this in mind because I love my work to look the best that it can. Thanks so much for sharing. There are a couple of pieces I have made that I was thinking about blocking. Does a blocked piece hold it’s shape after it has been washed? Also, if it has been washed once, can it still be blocked? I washed my Amazing Shawl from the challenge, but I liked the how some of the shawls had a more pointed look – I was thinking that it was because they were blocked. 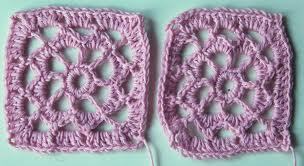 Thanks for info: When I make my doilies, I just gently dampen them with cold water, then use a light fabric stiffener or starch, and lay them on a flat surface to dry after I stretch them into the proper shape. When I need to wash a doilie, I just put it in a stocking bag and wash it on the gentle cycle in cold water, then go through the same process as above. Some of mine are over 30 years old and still look great. I am going to have to try blocking my squares for a baby blanket I am working on. I have been crocheting for a while now and had just recently heard about blocking. I had to look it up to see exactly what it was. I am glad that you found the information here. When I started I mostly focus on patterns and just making things. Now that I am further along and can do advanced patterns and write my own…..I get more into the details and extra things that I can do. I love the finished look that blocking provides. It makes it so smooth and beautiful. You should make sure you block based on the fiber you’ve used. 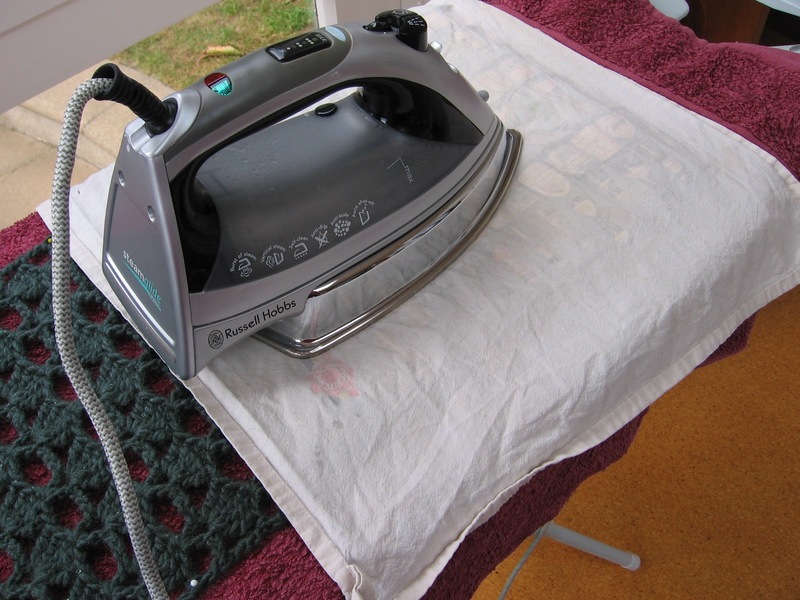 For example, you block 100% cotton by placing a wet cloth over the piece and using steam from your iron. If you use steam on a dry cloth, you’ll damage the cotton fibers beyond repair. You really need to know the textiles you’re working with and use the appropriate method. Google how to block for the exact fiber you’ve used and the item you’ve made so you do it correctly and don’t mess up all your hard work. This is GREAT information!!!! Usually you can find the info on the back of the yarn label, and adjust your blocking process accordingly. Do you think I should cover the yarn label and information available there? I’d appreciate it if you would. I have a hard time understanding all the care symbols used on yarn labels. I think it would be a good idea. I’ve been knitting, crocheting, sewing, and embroidering for more than 50 years and learned from my grandmothers and thier cronies. I always swatch, fit, block, etc because that’s how I was taught. With the resurgence of needle arts and the plethora of people who teach freely, I don’t think most people (including the self-taught teachers) know very much about fibers, how to read a label, etc. You’ll probably be reaching a very large audience of people who will thank you profusely. You’ll also be saving thier future projects for possible ruin. It’s really nice that you do this. There is so much to learn about crochet! And I absolutely LOVE every aspect. When it comes down to it…..you can literally make most of what you need in life with crochet (clothes, blankets, pot holders, toys, etc etc etc). Isnt that GREAT!!! I use steam blocking for the Red Heart super saver yarns as it makes them very soft and they then drape nicely also. The steaming converts them! These yarns tend to be scratchy and somewhat stiff but the price is inviting! I agree!!! Sometimes the cheaper yarn can be a little “off” for comfort.